Xcode 3.1 changed the way you pick a project template when creating a new project. Previous versions of Xcode had a list of all installed project templates for you to choose. Xcode 3.1 filled the left side of the New Project Assistant with project categories like Application and Framework. Selecting the category filled the top of the New Project Assistant with the project templates in that category. 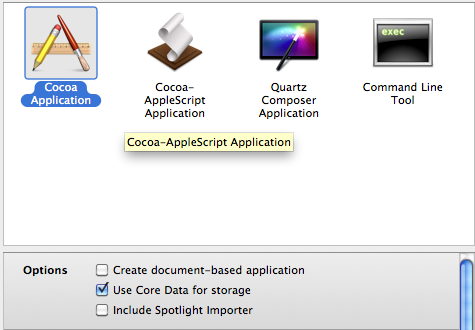 In Xcode 3.2, you have one template: Cocoa Application. There is an Options section with checkboxes for document-based applications, Core Data, and Spotlight importer. The screenshot provides a hint on how to create a command-line application in Xcode 3.2. Select Command Line Tool, and the Options checkboxes are replaced by a Type pop-up menu. Use the Type menu to pick the language: C, C++, or Objective-C. Choose Foundation to write an Objective-C command-line application.